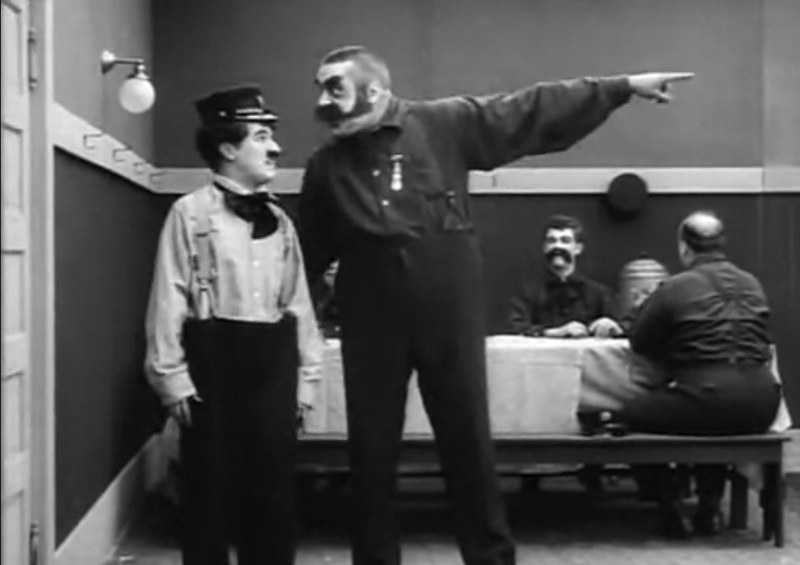 Once again, we have an early example of Charlie Chaplin’s work at Mutual Film, and once again, it seems to me a step down from “Police,” which he made at the end of his time at Essanay. The character is only about as lovable as he was in the days of “The Tramp” and “Work,” not at the level we saw him blossom into at the end of 1915. Here, Charlie is a fireman who lives at a fire station with several other men. When an alarm goes off, all of the others spring out of bed and down the pole with perfect (Keystone Cop-style) military precision. Charlie goes on snoozing, which is a shame because it’s his job to drive the fire engine. The foreman (Eric Campbell, Charlie’s new replacement for Mack Swain and Bud Jamison) is furious, and hollers until Chaplin gets up and slides leisurely down the pole, going back up again when he fears abuse from his boss. Eventually, Charlie pulls the wagon out into the street for the drill, but he leaves the brigade behind. He has to go back, and this time he gets some of his comeuppance. We now shift to a scene of the brigade sitting down to a meal, and Charlie serves them, in a sequence borrowed almost entirely from “Shanghaied.” In this case, however, Charlie doesn’t have to contend with the rocking boat, but he still manages to get food on almost everyone. One nice touch is that he gets hot coffee and cream from dispensers in the water tank on the fire engine. Another chase with the foreman ensues. A rich man (Lloyd Bacon) and his daughter (Edna Purviance) now arrive at the station and ask to meet with the foreman, who is covered in milk and soup. The man offers the foreman his daughter’s hand in marriage if he will let his building burn down – he wants to collect on the insurance. Edna seems to go along, but also flirts with Charlie when she gets the chance. The foreman goes along with the others on a date, leaving the fire house in Charlie’s charge. Now, a real fire breaks out and a frenetic man (Leo White) does everything he can to get help. He sounds the alarm, he calls the fire station, he runs to the fire station flailing his arms and running about like a ninny. The firemen ignore all his efforts, until he starts attacking Charlie. A strange sort of chase begins, with Charlie trying to slow him down or figure out what he’s saying, while Leo keeps running around waving his arms. Finally, Charlie figures out what he’s trying to say and runs off to get the foreman. The foreman, reluctant to abandon his date, eventually gets the message and rushes back to the station, rounds up the firemen and piles everyone onto the fire engine to race to the scene. The house is pretty well up in flames at this point, but the men do their best, although Charlie keeps pointing the hose at other people instead of the fire. Now Lloyd puts his plan into action and sets fire in the basement of his apartment building. Apparently he has forgotten that Edna is inside! When he sees her at her window, trapped by the smoke, he panics, and rushes off to find the fire truck. He tells Charlie that his daughter is in danger, and Charlie, ignoring the current fire, grabs the fire engine and rushes off alone. The foreman figures out what has happened and follows on foot. Charlie scales the side of the building and manages to carry Edna down, heroically saving her, before Eric can get to the scene. 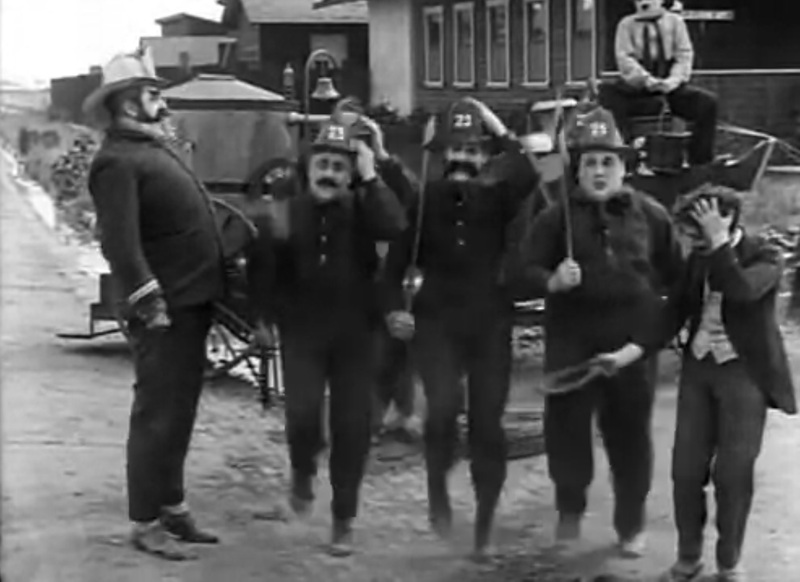 Fire stations were popular settings for slapstick comedy, probably in part because of all the mayhem that could be caused with spraying water, axes, etc. and the speedy chases to the rescue they encourage. 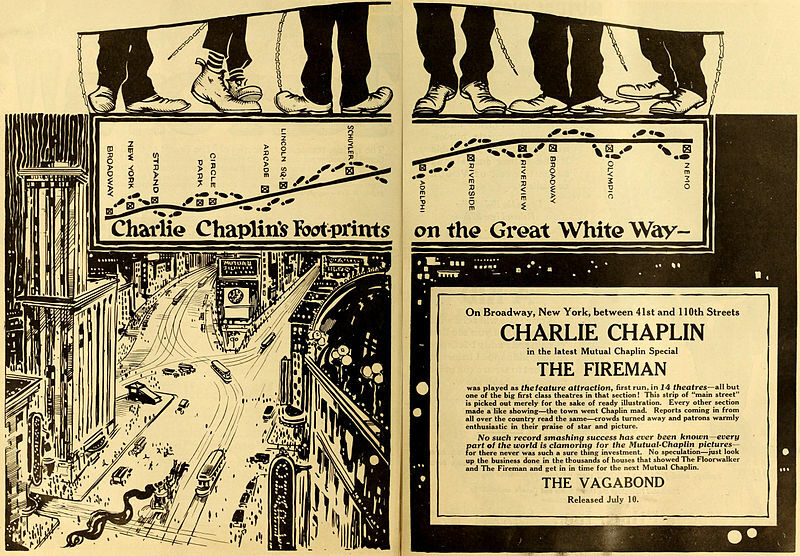 But, remember that some of the earliest plotted movies involved “Fire Rescues” and that live simulations of fire fighting were popular entertainment in the previous century. Each generation loves to mock what their elders took seriously, and I think that’s part of the reason for the trope. Substituting Charlie Chaplin for the muscular heroes of those movies rescuing the damsel in distress only makes it funnier. 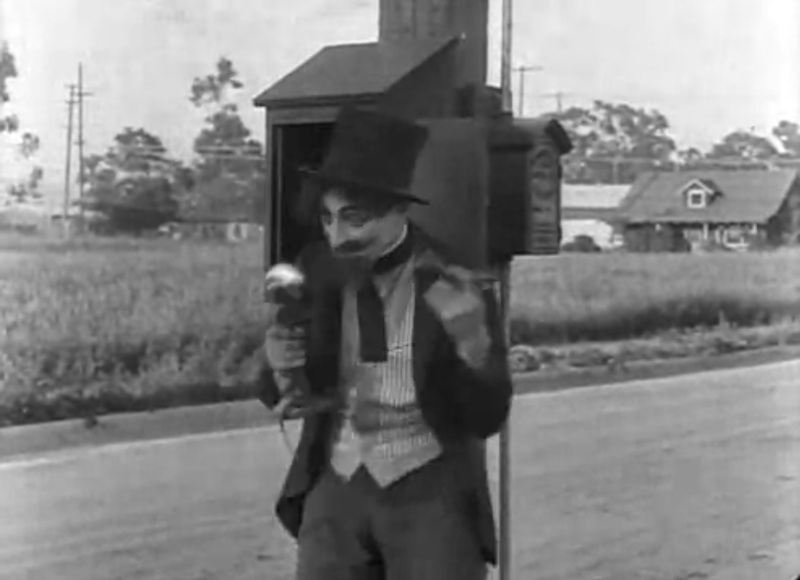 Still, Chaplin’s character here is only partly sympathetic. It’s hard to see a fireman who sleeps through alarms as a “victim” and he seems to go out of his way to start trouble with the foreman. Surely, he could serve coffee without spattering his boss and everyone else with boiling liquid? He’s kind of back to the “vulgar” character of mid-season Essanay. Edna’s character is also disappointing. She doesn’t outwardly rebel against her father pimping her for insurance money, and she doesn’t have the common sense to get out of a building her father is openly planning to burn down, and she ends up with Charlie solely because he gets there first. Not much agency there. Actually, the funniest person in this movie (in my opinion) is Leo White, who overacts insanely as the victim of a house fire, reminding one of a cross between Ford Sterling and a chicken with its head cut off. Particularly when he’s running up and down beside the fire engine, with Charlie trying to stop him at each pass, he’s the focus of action and laughter.